Cipriano Frederico Vigil is the most important performer of traditional Nuevomexicano folk music in the late twentieth and early twenty-first centuries. This bilingual panoramic book presents the songs that are his life’s work, spanning half a century of listening, playing, composing, and singing ritual, social, and dance music. 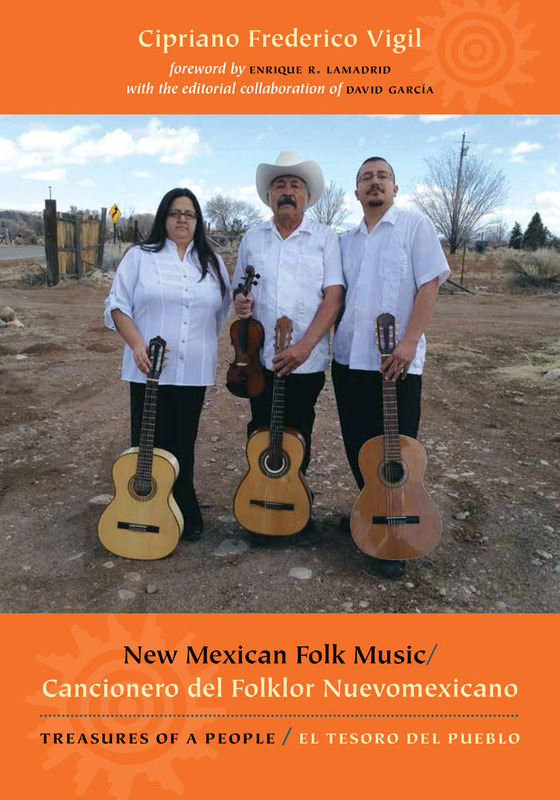 New Mexican Folk Music includes much traditional material that has never been seen before or studied by scholars or students. Renowned as a composer, Vigil works in traditional genres such as the romance, the décima, the cuando, and corrido. Like the Mexican group Los Folkloristas with which he apprenticed in the late 1970s, his goal has been to research and master local styles, to introduce new listeners to traditional music, and to build on tradition by creating new compositions that address contemporary social themes. An audio CD accompanies this comprehensive study on the work and music of Cipriano Frederico Vigil. Cipriano Frederico Vigil has been recognized by the New Mexico Endowment for the Humanities and the Smithsonian Institution. He received the New Mexico Governor’s Award in 1994. Vigil taught for many years at Northern New Mexico Community College.